The relative advantages and disadvantages of gun and missile air defence systems for warships is a complex issue, the balance of which shifts from time to time depending on technological developments both in the systems themselves and in the threats with which they have to cope. The major advantage held by missiles (at least up to the present) is that they can be steered all the way to the target. By contrast, the hit probability of a projectile from a gun decreases very rapidly with increasing distance, partly because of aiming errors or other ballistic influences (winds, barrel wear, variation in muzzle velocity) and partly because aircraft can manoeuvre and missiles are small and hence difficult to hit. On the other hand, guns have their own advantages. Ammunition is small and cheap, can be stored in great quantity and fired at a high rate, making up to some extent for the system's inherent inaccuracy. Their minimum range is virtually zero, whereas all current AA missiles (except small, man-portable systems) take time to come under full control after launching and thus have a minimum range which can be as much as 1km. 5km or more, guns preferable for ranges of under 2km, with a grey area in between. Against missiles, the effective range of all systems is sharply reduced. Developments such as the Russian Kashtan, which combines guns and missiles on one mount, appears to offer the most comprehensive anti-aircraft and anti-missile protection which will be available for the foreseeable future. has chosen to replace its Phalanx CIWS with RAM AA missiles in many of the Ticonderoga class cruisers, albeit in a modified version also capable of engaging surface targets. However, this may be more of a comment about the long-term effectiveness of the small-calibre Phalanx rather than of CIWS in general. Phalanx continues to be developed, the latest Block 1B version has barrels that are 46cm longer and thicker, to achieve a greater effective range, coupled with improved fire control systems. A different solution to this problem is offered by Oerlikon-Contraves, in the form of a 25mm KBD gun to replace the M61A1 in the Phalanx. All but the most specialised CIWS are also more versatile than missiles. They can be fired against surface vessels and land targets as well as aircraft, and can also fire warning shots in a display of determination - hardly economic, even if feasible, with missiles. 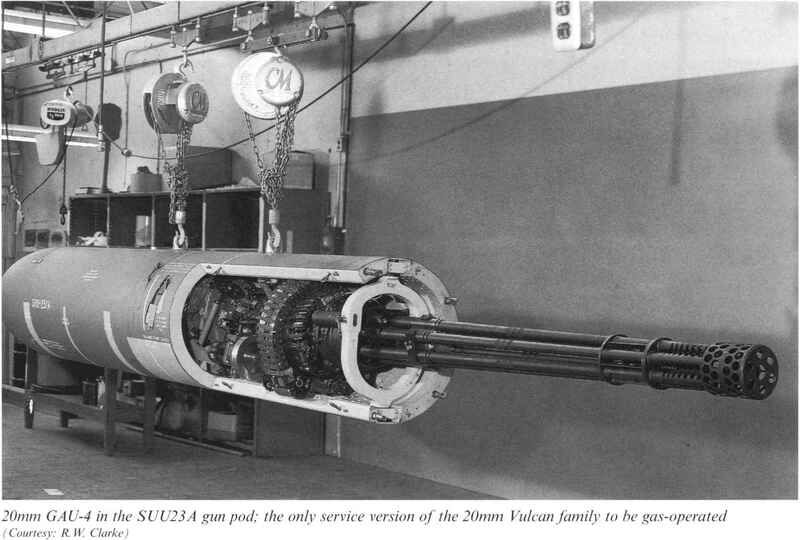 It was this final factor which really preserved the Oerlikon and Bofors guns in RN service after the introduction of the short-range Seacat missile, and it has also led to the retention of larger-calibre naval weapons. Modern warships sent to deal with terrorist insurrections in the Far East, a job which involved much stopping and searching of small vessels, found light cannon to be the most useful weapons. The involvement of NATO forces in the Persian Gulf during the Iran-Iraq war, which saw terrorist attacks using grenade launchers from small boats, underlined the message. It also emphasised the advantage of manually aimed over radar-directed guns in dealing with terrorist craft which may be manoeuvring within an innocent fishing fleet. The lesson is clear. Every warship needs at least one 'old-fashioned' manually aimed light cannon for dealing with low-level threats, and their more sophisticated CIWS cousins are also currently unrivalled (although under long-term threat) as a last-ditch defence against missile attack. Larger-calibre guns have also proved their worth in limited warfare, leading, for example, to the Batch 3 versions of the Royal Navy's Type 22 frigates to be fitted for the 4.5" Mk 8 (omitted from earlier batches) following experience in the Falklands conflict. While every destroyer or frigate class built or planned is equipped with a medium-calibre gun of at least 57mm, there is some debate about the ideal calibre. 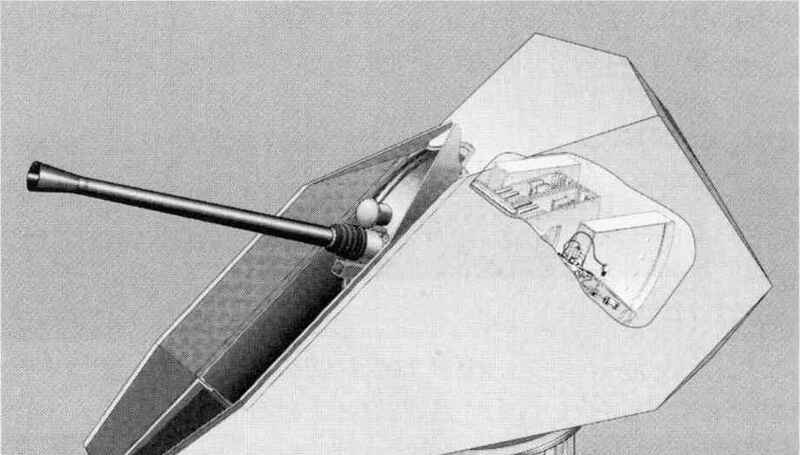 If a shore bombardment role is likely to be significant, a gun of at least 100mm and preferably 127mm is the obvious choice. In fact, the US Marines like gunfire support to be as large as possible - they were among the strongest supporters of retaining the 16" (406mm) gun Iowa class battleships in service and have encouraged the development of various guns of 155-203mm calibre. On the other hand, the spread to developing nations of long range anti-ship missiles, capable of being fired from the shore, is undoubtedly increasing the risk of the shore bombardment role. It seems likely that guns will be supplemented by longer-range missiles (apart from the very expensive Tomahawk cruise missiles) in the future. For the short term, the USN is working on a land attack version of the SM-2 AA missile, using GPS and inertial guidance. An accurate range in excess of seventy miles (112 km) has been demonstrated. 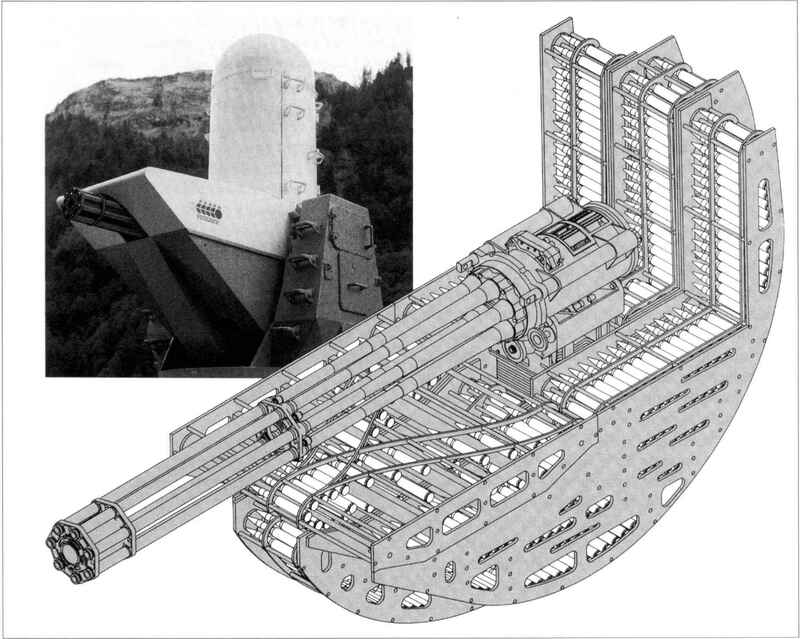 al was the fixed, vertically firing 155mm gun being developed by the US Navy, designed to fire its projectiles high into the stratosphere, from where they extend fins and glide down, guided to targets lOOnm (185km) or more away. This results in a very simple and inexpensive weapon, with the guidance being achieved by the projectiles (typically using GPS systems, which have already been proved to function when fired in conventional shells) rather than the gun. Smaller-calibre guns such as the 57mm Bofors or 76mm OtoBreda have the advantage of very high rates of fire, which makes them much more credible as AA and even anti-missile weapons. Practical combat experience is no guide in deciding the right calibre to meet all circumstances; the Falklands conflict saw extensive use of 4.5" (114mm) guns for shore bombardment, with over 8,000 rounds being fired. On the other hand, those ships subjected to intense air attack in San Carlos Water would doubtless have benefited from a gun biased more towards the AA role. For the future, the effectiveness of guns will be further enhanced by the continued development of ammunition, both with sophisticated fuzing technology, such as the Bofors 3P round, and with steerable capability. The automatic cannon, in various guises, is not going to disappear from warships in the foreseeable future.